Who is the thief? Which is a man of honor? Wonderfully complex and pleasing Victorian-era mystery! Eleanor Sheffield is an expert at recognizing forgeries, but can she discern who speaks the truth, who is manipulating her, and who is the true thief? While desperately trying to keep her family’s antiques firm afloat, care for an uncle with dementia, and provide for those who depend upon her, Eleanor must decide whether to donate an estate of a thousand treasures to a museum or allow it to remain with the previous owner’s heir. She must discover the truth behind her directive and the letters from her former fiancé’s father. Is Harry who she believes him to be or is he a womanizer taking advantage of her good will? Can she objectively choose justice while her heart is involved? Even as Eleanor inventories the treasures, tracks down lost items, and puzzles over past events, she must keep her firm afloat, slowly selling the few family treasures that remain. While the debtor’s prison looms over every decision, she strives to make her place in a man’s world. Friends and mentors may not be able to save her. But perhaps someone else can. 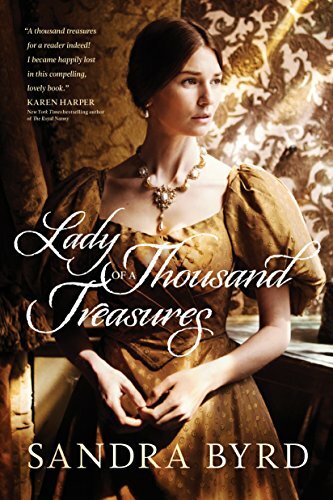 Lady of a Thousand Treasures is a Victorian romance/mystery wrapped around snippets of history and antique collecting factoids and expertise, while sprinkled among the plotlines are historical figures and insights into a lady’s place in society. Eleanor must overcome the prejudices of her time, use every bit of wit about her, and not lose herself to the poisonous lies of false friends. It’s a road fraught with peril that threatens not only herself, but her loved ones. While Eleanor strives to live by her Christian faith and it is an integral part of the story, it is woven into the storyline so deftly and unobtrusively that it makes it that much more believable. I have a prejudice against books where religion and scripture are a jarring, disruptive, and annoying intrusion, rather than a treasured, believable part of a character’s life. The whole Christian element is done with such taste and style that I think even non-believers will find it consistent with the characters, true to the actors’ era, and not “preaching” or in-your-face offensive. Highly recommended for those who enjoy historical, Victorian, or Regency romances, clean romance, gothic novels, mysteries, and skilled storytelling.